A comparison of stained neural progenitors (pink) in a young (left) and old (right) brainCOURTESY OF MAURA BOLDRINIAdult human hippocampi are home to thousands of immature neurons, researchers report today (April 5) in Cell Stem Cell. The result runs counter to a paper published last month in Nature that found no evidence of neural precursor cells or immature neurons in adults. 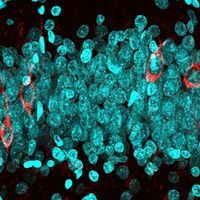 Such contradictory findings raise questions about researchers’ understanding of neurogenesis in human adult hippocampi, which are central to learning and memory. “There’s been a long-standing debate about adult human neurogenesis,” Xinyu Zhao, a neurobiologist at the University of Wisconsin-Madison who was not involved in either study, tells The Scientist. She says the latest work in Cell Stem Cell is notable because it uses stereology—the gold standard of neurogenesis studies in animals—to count immature and mature neurons in the hippocampi of healthy humans. 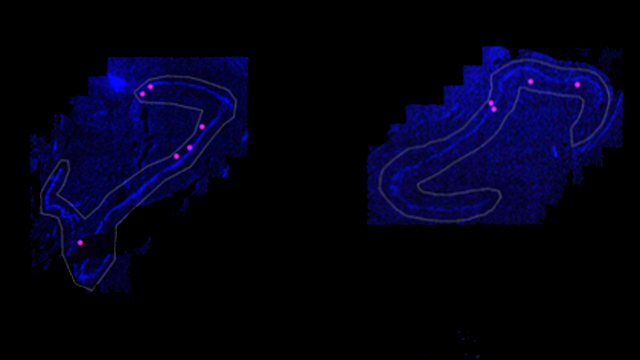 Stereology can determine the number of individual cell types in tissue, even when the sample has been sliced into sections. In the new work, Maura Boldrini, a neurobiologist at Columbia University, and her colleagues examined postmortem brain tissue of 28 healthy people between 14 and 79 years old, less than 26 hours after the individuals had died. The team wanted to see if it could identify signs of neurogenesis in the human brain tissue given that past studies have reported mixed results about new neuron development in older human brains. To do this, the team quantified the abundance of specific proteins in hippocampal cells with marker antibody staining: GFAP, nestin, and Sox2 for neural progenitor cells; Ki-67 and nestin for intermediate neural progenitors; DCX and PSA-NCAM for immature granule neurons; and NeuN for mature granule neurons. Many of these same markers were used to probe for different types of neuronal cells in the Nature study, but Baldrini notes that, in contrast to her material, some of the tissue used in that case wasn’t fixed until up to two days after death, and the researchers did not examine the whole hippocampus. 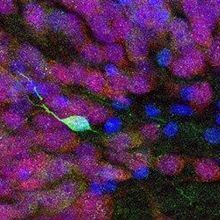 Boldrini’s team found that in older adults the pool of neural progenitor cells was smaller in the front and middle of the dentate gyrus—the region of the hippocampus where neurogenesis is thought to occur—compared with younger adults. There were approximately 1,000 neural progenitor cells per front, middle, and back of the dentate gyrus in the older adults. However, intermediate neural progenitors did not appear to decline with age. There were thousands in each region from all the brains. Immature neurons were also present on the order of a few thousand per region of the dentate gyrus in each person, suggesting no decline in neurogenesis as people got older. The researchers also found fewer PSA-NCAM+ cells of different morphologies in the front of the dentate gyrus from the brains of older people, which “likely represents a decline in neuroplasticity,” the team writes. If the cells weren’t migrating or sprouting dendrites—factors that change their morphology—it could mean they had trouble integrating into the already existing circuits, Boldrini explains. Older brains also had less development of new blood vessels compared with younger brains in the anterior dentate gyrus, the team found. The front region of the dentate gyrus, Boldrini explains, has been linked to emotion and is connected to amygdala, responsible for fear and stress. “This new result suggests that the anterior region might be more vulnerable to aging,” she says. While the new study “offers interesting evidence of declining blood vessel growth in the adult hippocampus, we dispute the interpretation of their cellular staining experiments as evidence of new neurons in the adult brain,” Shawn Sorrells and Mercedes Paredes of the University of California, San Francisco (UCSF), coauthors of the Nature study, write in an email to The Scientist. Sorrells and Paredes note that identifying new neurons in the hippocampus is technically challenging and that in their recent study, they made similar observations to Boldrini and her colleagues’, but after performing extensive additional analysis of the shape and appearance of the cells in question, including electron microscopy and gene expression, the UCSF researchers determined that the cells were not, in fact, young neurons or neural progenitors. They were different cell types altogether. Zhao isn’t so certain. 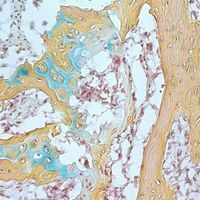 Such staining, or histology, studies have limitations: protein levels, for example, can decrease if there is a long lag time, say, several days, between when a person died and when her tissue is fixed and analyzed. 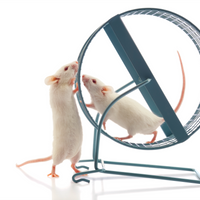 Different preparation protocols might lead to different results. “I would never consider this the only method to support neurogenesis or not,” she says. Zhao suggests researchers develop new methods to track neurogenesis in human adults. M. Boldrini et al. “Human hippocampal neurogenesis persists throughout aging,” Cell Stem Cell, doi:10.1016/j.stem.2018.03.015, 2018.